I love granola. I can eat it by the bag, but it is one of those foods that seems like a healthy choice when you see it on the store shelf but despite the marketing label (organic! whole-grains!) it is usually riddled with added sugar and processed ingredients. Hubby asked me if I would pick up a bag of granola from the grocery store and after reviewing all the ingredient labels, I couldn't find even one that didn't have an added sugar as the first ingredient. Now, don't get me wrong, I eat junk food sometimes too (I'm not a robot) it's just that I don't like when the foods that are supposed to be healthy turn out to really be junk food in disguise. There is almost always a healthier alternative to any junk food we enjoy, so I did my research (aka Pinterest) like any good nutrition coach and found a healthy-ish recipe that I could adapt and make my own. You can find the original recipe I used here. 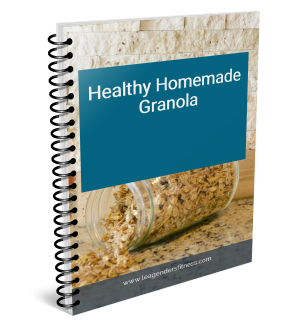 I like the idea of homemade granola because I can control the ingredients and I don't have to worry about any mystery additions. This recipe is so easy, even I could follow it. healthy homemade granola plus a high protein berry parfait. save to your favorite Pinterest board for later. Mix oats, almonds and coconut on a cookie sheet and toast for 15 minutes, stirring occasionally. Combine the honey, coconut oil, cinnamon and vanilla in a separate bowl. When the oats are toasted, add the toasted oats in the bowl with the rest of the ingredients and mix well with a spoon. Line a baking sheet with wax paper and form a single layer of the toasted oats. Turn the oven off and then place the baking sheet back in the oven for eight minutes to continue toasting in the warm oven. Store in a cool dry place (I used a mason jar). They are not as cluster-y as the store-bought kind, but I'd dare to say even more delicious. But just like anything else with sugar (honey is a natural sugar), it should be enjoyed in moderation. This healthy homemade granola is a perfect topping for a yogurt berry parfait. 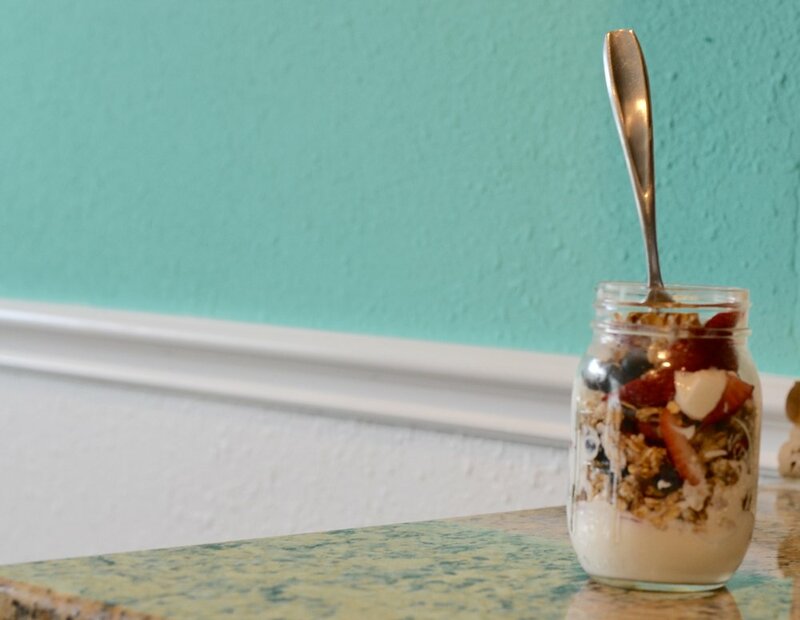 Layer the yogurt, berries and granola for a healthy snack. Greek yogurt is high in protein, this makes an ideal post-run refuel with healthy fats, carbs, and protein. Add your email address to download a free PDF ebook of this blog post and to receive news and updates from the strength and running blog.